“I’m awesome,” Noah commented at 7:20 in the morning a week before school started. He was in the kitchen, having successfully completed his first practice-getting-ready-for-school-in-forty-five minutes. Noah’s always been an early riser and he didn’t have to leave for school until 8:20 in elementary school, so he generally had hours to get ready. He liked to start his day in a leisurely fashion, reading articles from Car and Driver behind a closed door in the bathroom, often while June pleaded for her turn. But now that he needs to catch a 7:15 bus that’s at a stop a half-hour walk from our house, he needs to be out the door more than an hour and a half earlier than last year. I could rant here about how they make kids get up earlier just as they are starting to sleep later (he still wakes before seven most mornings, but there were a few times this summer he surprised me by sleeping until eight or so.) Chances are you’ve heard this rant from a parent of a middle or high school student recently, though, so to save time, can you just replay the highlights in your head? Thanks! As Noah had camp the week before school started, Beth had the idea that he should try to be ready in forty-five minutes every day, no matter when he woke. That way we’d know if waking him up at six o’clock was going to work. The idea of waking him at any time is anathema to me, after eleven years and four months of trying to get first one and then the other kid to sleep longer. But there you have it. For most of the week, the plan was for him to note what time he got up and get ready in forty-five minutes, rather than getting up any earlier than necessary. He was ready or very close to it in forty-five minutes every day from Monday to Wednesday, and while he never woke before six, he wasn’t sleeping much later than that. The countdown always started between 6:05 and 6:35. June and I went to Spanish Circle Time at the library, came home, ate lunch and waited for Noah’s return so we could take him to camp. 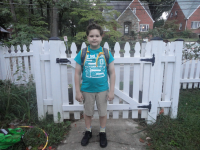 He got home around 12:20, after an abbreviated day in which he ran through his schedule and met all his teachers. He had nothing to say to my questions about what class seemed like it would be the most fun, the hardest, etc. but that didn’t surprise me. Open-ended questions like that tend to stump him. Often you need to wait for him to process an experience and tell you about it later on his own. (I’m not much different myself, which is why you’ll learn a lot more about me reading here than if you were to surprise me by calling on the phone.) We did learn he doesn’t have any classes with his friend Maura, who has been in at least one class with him every year since kindergarten, first at one elementary school and then at another. (They also share a birthday.) We were sorry to hear the streak is over. Friday the kids both slept past seven, perhaps needing to recover from their early start the previous day. Because June’s school was holding its Open House in the early afternoon and Noah had a drama camp performance in the late afternoon, Beth decided to work at home in the morning and take the afternoon off. June had a play date in the morning and when it was time to go to the Open House, we took Keller with us to school, where her mom met us and we split up to meet our kids’ teachers. In the morning June has Señorita M, who was Noah’s first grade Spanish teacher, and who seemed happy to meet June. In the afternoon she has Ms. R, who is new to us. In each classroom we studied the class lists posted outside the door and June encountered the names of many of her old friends. She encountered the friends, too, and there was much hugging and excited chatter. June’s happy to have preschool and basketball friends Maggie and Zoë in class this year but sad that her “best best best friend” Megan is not in either of her classes. Later in the afternoon we attended our fourth and final drama camp performance of the summer. Noah did a clowning/mime routine about picking a stubborn flower. Leaving the familiar theater for the last time until next year made it seem as if summer was really drawing to a close. By the weekend before school started, the kids’ summer homework was all but finished. They both completed their math packets some time in July, and in August Noah had written some short essays on his assigned summer reading, plus he had to write a poem, pick a song that reminded him of a character in Watership Down and design a CD cover with song titles for his own fictitious album. June had written a paragraph but she still needed to fill in her summer reading log with the twelve chapter books I’d read to her or she’d read on her own. June was still working on the log on Saturday and Noah didn’t finish illustrating his poem until Sunday but we still had time that last weekend for cell-phone shopping (Noah’s first), a potluck end-of-summer pool party at Sasha’s and a final play date with the twins (and Sasha, who dropped by to return our cheese boards, which we’d left at the party, and then stayed so he could help Noah and Richard and David build a wall of blocks and smash it with a remote control robot). Sunday evening we went out for ice cream, a last-night-of-summer-break tradition. As we ate Noah pointed out we had not gone to the movies this summer (I did take June and two of her friends to see Kit Kitteredge at the $1 movies one morning but he had not come with us). Beth and I had been intending to take Noah to a movie but we never did. We could still do it, I pointed out. “Yeah, he’s not dead,” Beth agreed. Noah grumbled about probably having so much homework he couldn’t do anything so it would be like being dead. ‘You were fun, fun, fun!” June chimed in. “You were boring, boring, boring.” The pre-adolescent opined. June said he shouldn’t complain about summer and school. 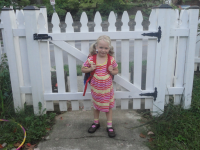 She announced a couple weeks ago without my asking her, “I’m ready for first grade!” Noah’s been less spontaneously enthusiastic but I think that may come with the territory. When I’m not wondering how on earth I ended up with a son old enough to be in middle school (middle school, people!) or wondering who will keep track of him when he has no one main teacher, I’m excited about the humanities program. I think it will provide him with the challenge and stimulation he needs. And I think he’s going to meet some wonderfully smart and quirky kids, as he did in the gifted magnet center he attended the past two years. 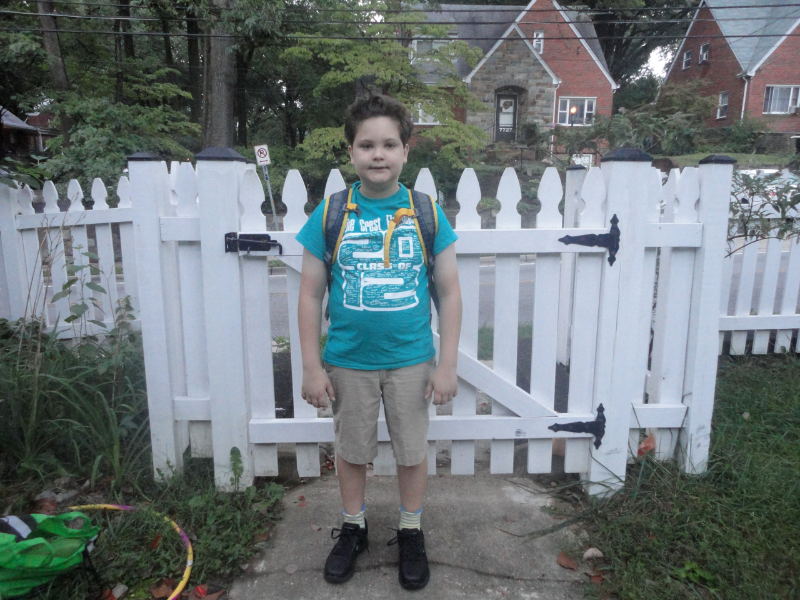 It was a strange first-day-of-school morning because Beth and Noah were out the door before June was out of bed and I only scrambled out in time to watch from the window as Beth and Noah disappeared down the sidewalk. (I had given Noah a good luck hug in the bathroom ten minutes earlier.) Instead of the normal, noisy scramble of getting two kids ready at once, June and I were alone in the house from 6:45 until 8:20. It felt unnaturally quiet and calm. June: How was your first day of school? Noah: Good. How was yours? I didn’t get much more than that out of Noah, but June said the day seemed to go really quickly, “like six minutes” and they had two fire drills (one in each class) and both teachers read a story (one about a frog who dreamed he went to school in his underwear) and she played with blocks and when Ms. R went over the class rules she said the most important one was “Have fun.” Noah did mention that he couldn’t get his locker open so he had to bring everything home and that his gym teacher gave a Power Point presentation, which makes me think gym has changed a lot since I was in middle school. 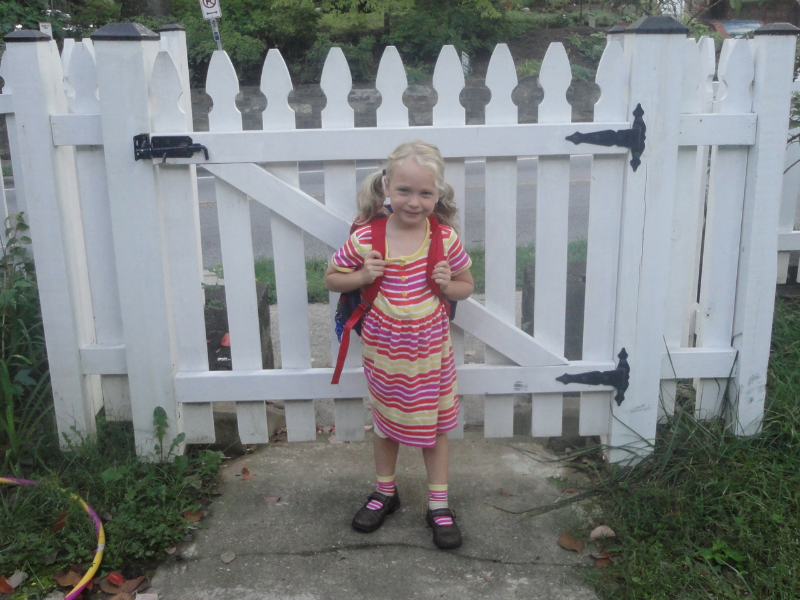 In some ways the first day of school is always the same. The picture at the gate, the mix of excitement and reluctance, a tinge of melancholy at the end of summer, the curiosity about what lies ahead, and the promise of a whole new year spread out before us. But of course some years are different than others, especially when one of the kids is changing schools, taking a bigger leap. June took one last year, now it’s Noah’s turn. Some years that first step onto the school bus seems like the same old thing, but some years it’s not the same thing at all. This entry was posted in Friends, School, Sleep and Naps by Steph. Bookmark the permalink.